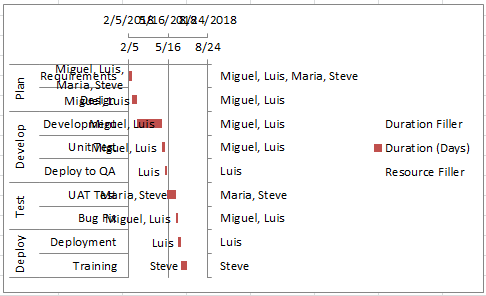 I recently received a request from a fan that asked how he could add resource names to Excel Gantt Chart that he had created. 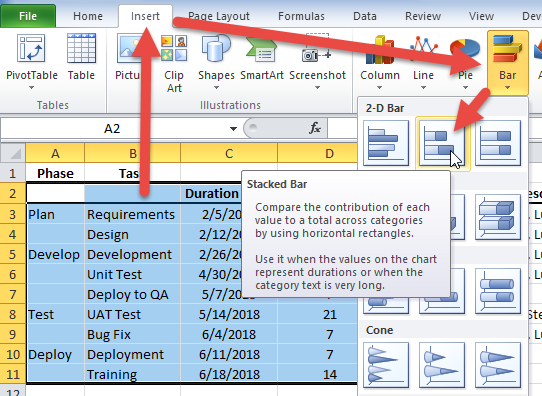 The technique I describe below is a technique that you can use to add more task information to your Excel Gantt Charts. 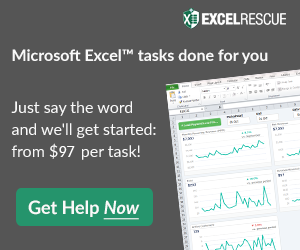 One caveat, this technique will work for any Excel version past 2003. 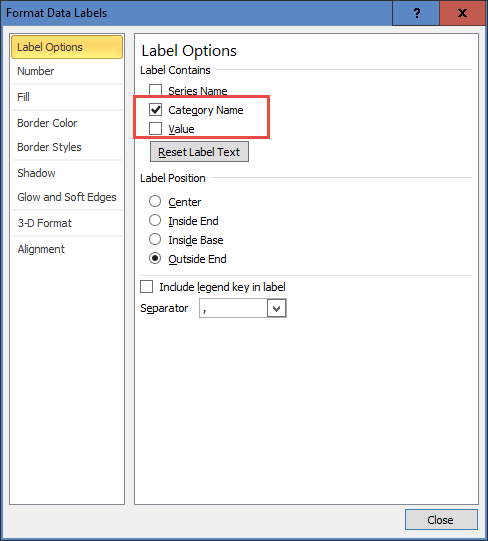 It is a great workaround to add labels in Excel 2007 and Excel 2010. However, for Excel 2013 and Excel 2016 there is a much easier technique that I will demonstrate in the next post. 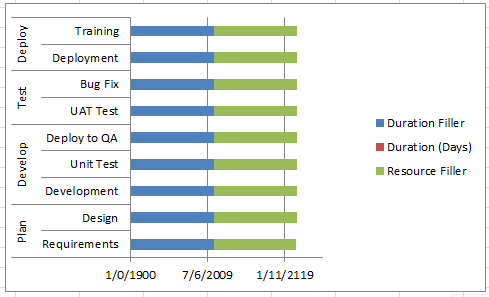 The crux of this technique is to add another data series to the chart that will be put on the secondary axis so that the labels can display alternate categories. 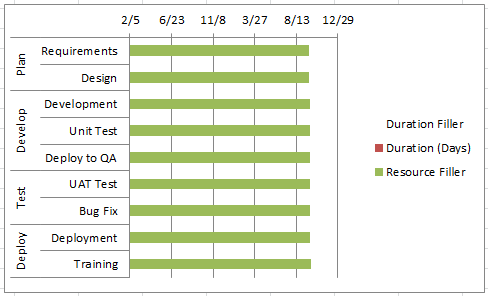 The first step is to add 2 columns of data to your Excel Gantt Chart data range. A) One, in column “E” add a filler series called “Resource Filler” to the right of the duration data. This is a calculated column. In Cell E3 enter =C3+D3. 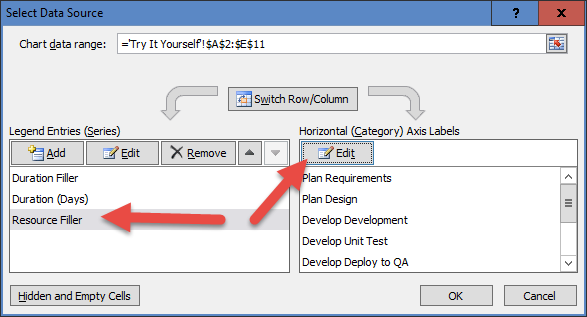 B) Two, in column “F” add the resource names that you want to have for your labels by task line. 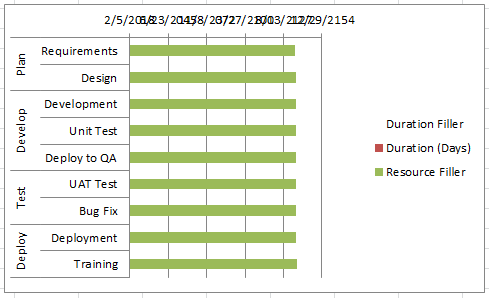 Next, we will want to create a Stacked Column Chart. The next step is to modify the “Duration Filler” series fill color. 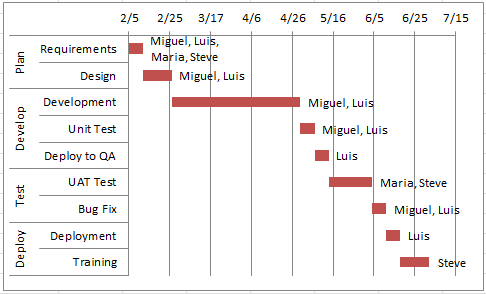 In order for the Excel Gantt Chart to have a Gantt Chart look, we need to make this filler series disappear on screen. To complete this step, select the chart, then double click on the “Duration Filler” series. 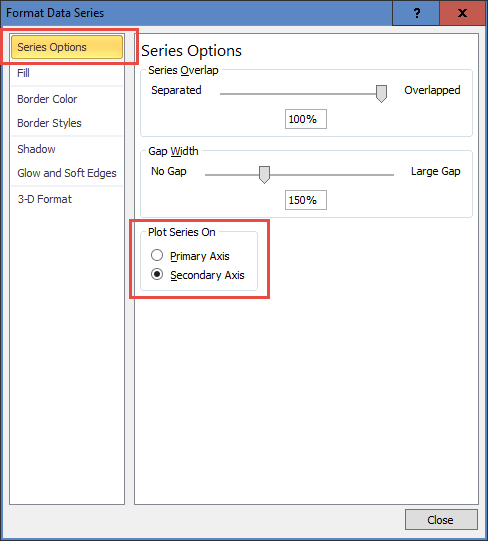 Or select the series and press CTRL+1 to bring up the Format Series dialog box. Then click on the Fill options and choose “No Fill” so that the series is now not visible but still there. Now you may have noticed that both the horizontal and vertical axes have issues that need to be corrected. One, the vertical axis needs to be reversed so that Plan is on top and Deploy on the bottom. Also, the horizontal axis starts at the year 1900. 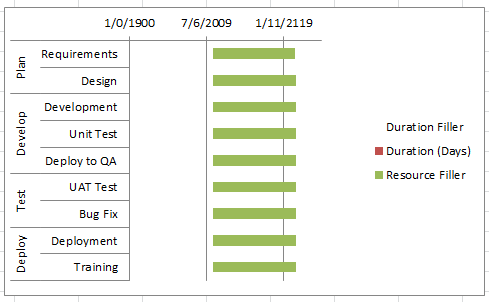 We need to fix that as well as that is too far in the past and as our Excel Gantt Chart won’t span years, we can remove the year from the number format without issue. To move Plan to the top of the vertical axis, first select the chart, then double click on the vertical axis or select it and press CTRL+1 to bring up the Format Axis dialog box. Next, click on the “Categories in reverse order” checkbox and press the close button. In order to show a small task duration on the chart, you will need to set the minimum value on the chart’s horizontal axis to a more recent date. 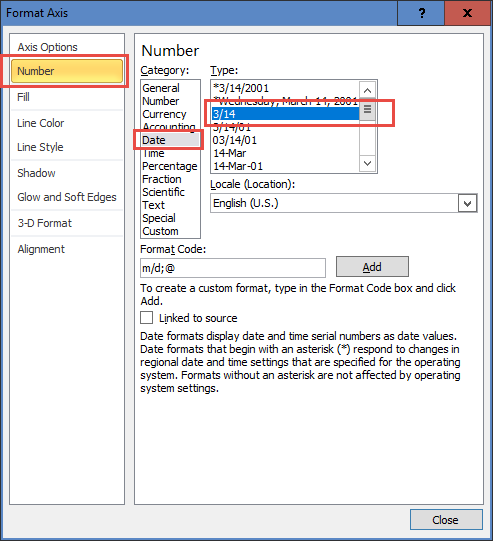 By default, Excel sets a date of January 1st, 1900 if you have a value of zero (0) but display it as a date. All dates are actually numbers, so our chart is showing the base of zero for the chart as the minimum even though we would want to show a later date. April 5, 2012, which is our minimum date on the Duration Filler column is equal to 43,136, so it is best if we start are chart at that date. 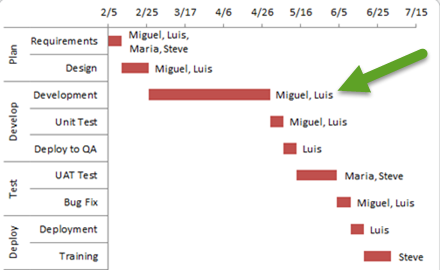 As you can see when we change the minimum value for the Horizontal Axis our dates overlap and it is unreadable. 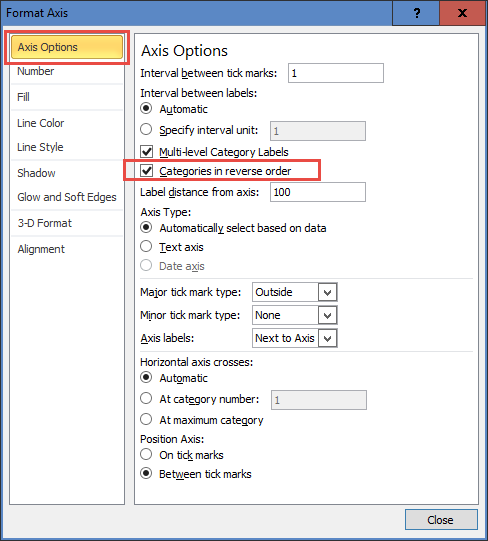 The solution is to change the number format in the chart axis. Now we are going to start really messing with the chart. In order for this technique to work, we need to move the “Resource Filler” chart series to the Secondary Axis. Now you may have noticed that we now see the secondary horizontal axis but not the vertical axis in the chart. We will need to show the secondary vertical axis as well as change the order to match the reversed order of the primary axis. Finally, we will need to modify the secondary horizontal axis to start at 2/5 to match the primary axis minimum fixed value. As we won’t be displaying the secondary horizontal axis, we will leave the number format unchanged. As you can see above, the secondary vertical axis does not match the primary. 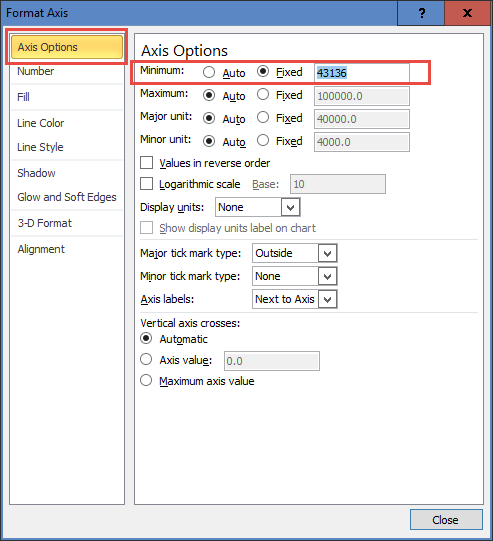 To move Plan to the top of the secondary vertical axis, first select the chart, then double click on the secondary vertical axis or select it and press CTRL+1 to bring up the Format Axis dialog box. Next, click on the “Categories in reverse order” checkbox and press the close button. Just as we did for the primary horizontal axis, we need to fix the minimum value on the secondary vertical axis. C) Finally, select the range that you have for your resource names by task. In our case, it is F3:F11 as you see here. 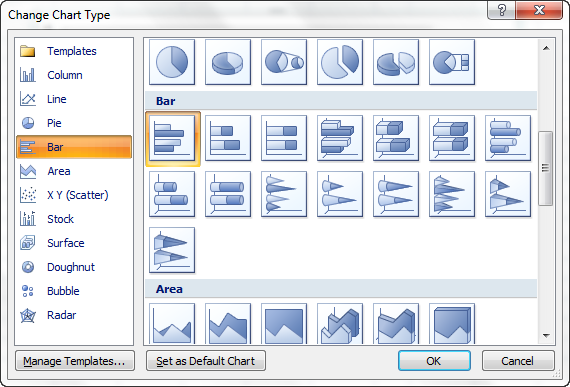 Then press OK on all dialog boxes to finalize your updates to the secondary axis labels. 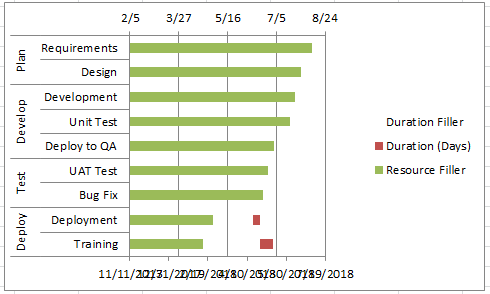 In order to make our labels appear at the end of each Gantt task, we need to change the chart type of the “Resource Filler” series on the secondary axis to a Clustered Bar Chart. This will allow us to place a label on the end of the bar as opposed to only on the inside of a stacked bar chart. 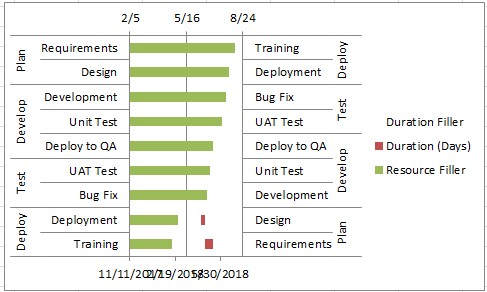 Your chart will now look like this. It may look strange as the series is now being plotted along with the resource names, but don’t worry, when we delete the Secondary Axes, it will align to the Phase and Task labels on the left. 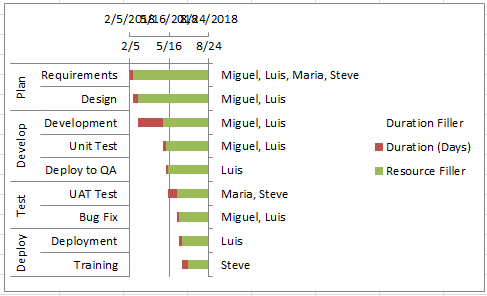 Finally, we are at a point that we can Add Resource Names to Excel Gantt Chart Tasks by adding labels to the “Resource Filler” chart series and then modify them to display the category labels instead of the value. 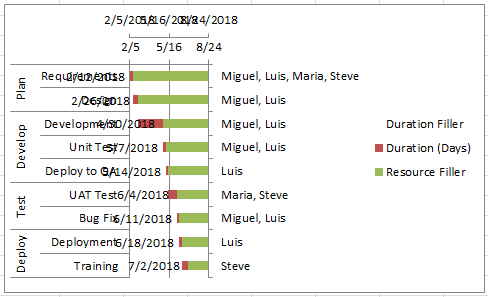 Excel default for data labels in a chart will display Values. We need to change ours to Categories. To do that, first, select the chart, then double-click on any of the data labels we just added like the “7/2/2018” at the bottom middle of the chart or select it and press CTRL+1 to bring up the “Data Labels” dialog box. We are almost done. We have left the “Resource Filler” series as an automatic solid fill of green this whole time so that we would be able to select the series as needed. But we don’t need to see it anymore. So let’s hide it from the chart by changing the Fill Option to “No Fill”. Last but not least is to clean the chart up of unneeded items and this will create the final look and feel you were looking for with the Gantt Chart Format in Excel. This is pretty simple. First select your chart, then select each of these items and press the delete key. 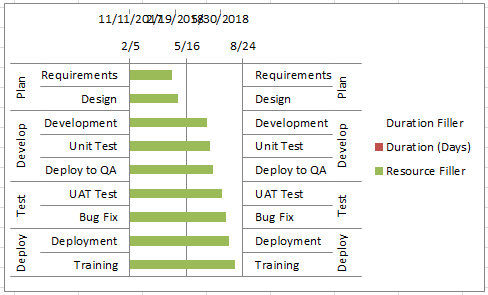 You can use this technique to show any task information in your Gantt charts that you wish, such as Percent Complete (% Complete), Assigned Resources, Start Date and Finish Date. The possibilities are only limited by your imagination. Check out this Video tutorial on the techniques presented above. 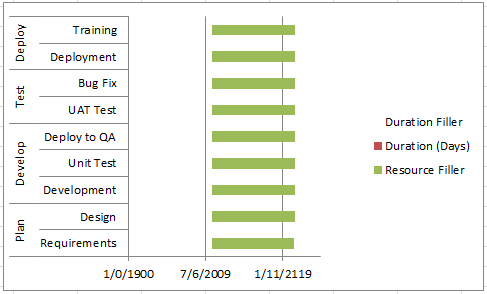 This is a great trick to add more detail to any line chart, column chart or bar chart within Excel. 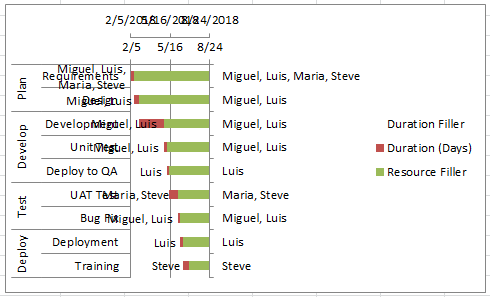 Do you think that Excel should default to show all of the secondary axes? 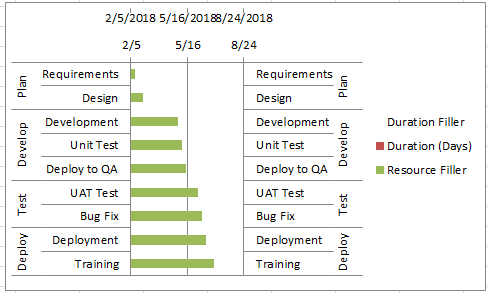 Do you like this Excel Gantt Chart technique? Let me know in the comments below. Also, make sure you sign up for the newsletter so that you get the notification of the release of the video on how you can do this more easily in Excel 2013 and Excel 2016 in the next post. Hi Jo, it looks like your dates overlap so it may not work as you would like. i.e. both Green and Orange overlap to 2018. 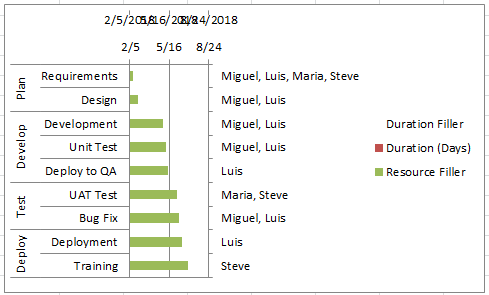 However, i would recommend that you use Conditional Formatting from the Home Ribbon and use the Highlight Cells Between option. You will have to do it 3 times on the same range. If you need a formula, you can use this for the between ones: =AND($A1>41759,$A1<43220) [assumes your data is in column A]. Also I have converted the dates to a number to see the value of 30/4/2014 and 4/30/2018.